'History Vendor,' an interactive art exhibit by photographer Chris Dahlquist, pairs historic photographs with maps to their current day location. What do you expect to find at a vending machine? Soda or chips? How about a full-blown history tour? That’s the idea behind photographer Chris Dahlquist’s exhibit History Vendor, located at City Market Park on 3rd and Main Street through mid-October. The project includes three stock machines fitted to dispense free cards that pair historic photographs with maps of where they were taken. The project, commissioned by the Kansas City Municipal Art Commission for Art in the Park, aims to connect visitors with the identity and culture of the River Market area. 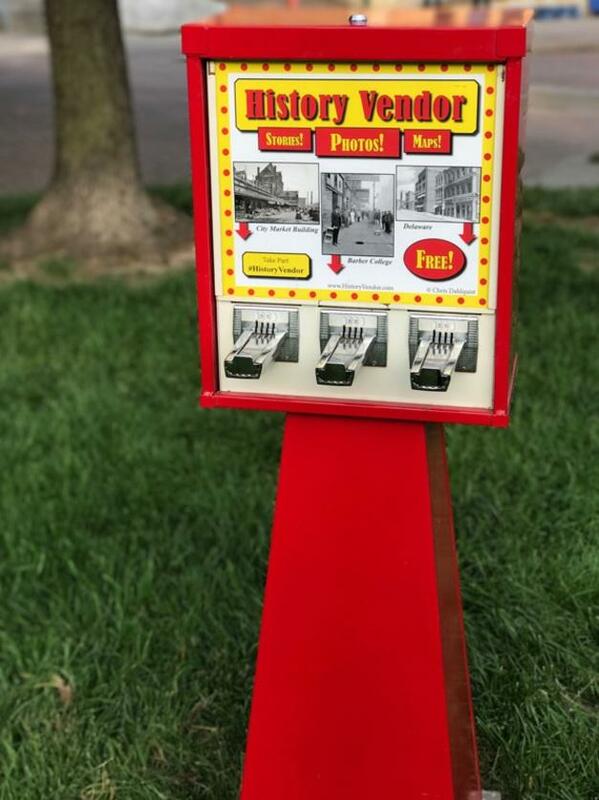 Three vending machines placed throughout City Market Park provide visitors with free history tours through the River Market area. “I found some vintage vending machines meant to vend temporary tattoos or stickers, but it seemed like a great way to dispense something more than that,” says Dahlquist, who has lived in Kansas City's Columbus Park neighborhood for 12 years. She spoke with Steve Kraske on a recent episode of KCUR's Up To Date about a long-term fascination with the rich history of Kansas City’s oldest incorporated district. “I’m a resident of the area, so I’m really interested in the history, and I thought this would be a great way to have a scavenger hunt meet history lesson,” says Dahlquist. The historical photographs inside the vending machines are courtesy of the Missouri Valley Special Collections at the Kansas City Public Library, a resource of documents and materials detailing the history of the region. 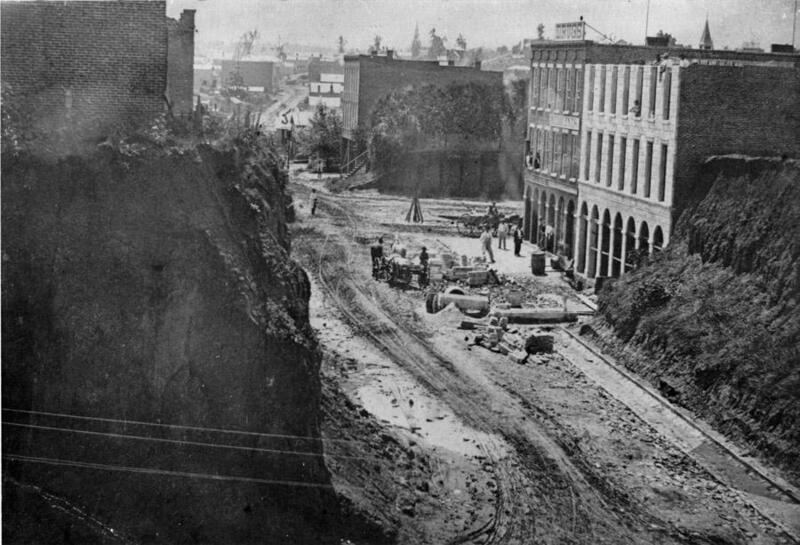 The oldest image included in History Vendor was taken in 1865, and captures a construction scene along 3rd and Delaware, before a bridge was built across the Missouri River. In the mid-19th century, Kansas City was often referred to as ‘Gully Town’ because of the deep trenches dug into the high bluffs that used to surround the Missouri River. The underlying limestone bedrock provided a much more stable foundation on which to build. “I’ve loved this image for a long time,” says Michael Wells, a local history and genealogy research specialist at the Missouri Valley Special Collections, who also spoke with Up To Date host Steve Kraske. “In addition to the buildings that you see there during early development, you also see the street grading that went on to level out the early city," Wells says. “The city had earned the nickname 'Gully Town' prior to this grading, due to all the ravines and valleys that stood in the way of any significant development." Wells says Kansas City’s unruly terrain helped attract diverse workers to the region. The area has also seen a much more recent development that harkens back to days of old. 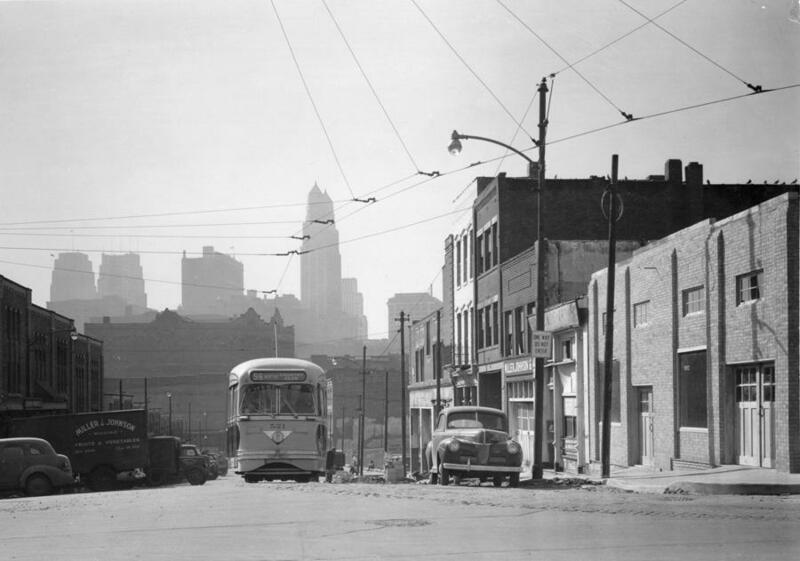 In May 2016, streetcar service returned to the neighborhood after operations ceased in 1956. A streetcar on Main Street in 1950. Dahlquist made sure to include in History Vendor a photo of an old streetcar traveling down Main Street. The images are meant to not only take you through time but to drop you right into the photographer's shoes. Listen to Steve Kraske's entire conversation with Chris Dahlquist and Michael Wells here. Coy Dugger is an assistant producer for KCUR’s Up To Date. Contact him at uptodate@kcur.org. People generally get their history lessons from a book or movie, not from a vending machine. Today, we learn about a novel way to put historical photos of Kansas City into the hands of City Market Park visitors.